Businesses have an obligation to respect human rights in their own operations, associated products and services and through their business relationships. 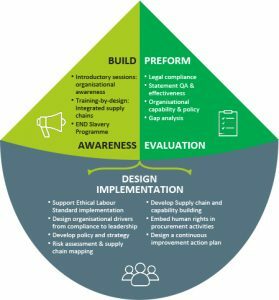 International guidance and local legislation means businesses must adopt new approaches to assess and mitigate adverse human rights and modern slavery. The programme entails three elements you can adopt sequentially, or select areas that support your organisation’s bespoke maturity. Action Sustainability and Ardea International have partnered to bring you the ACT to END Supply Chain Slavery Programme, designed for modern slavery risk mitigation and continuous improvement. Using our combined experience in legal and supply chain excellence this programme is designed to help you, wherever you are in your ACT to END journey.